News President's Message - IRTA Finishes Another Great Year! President’s Message – IRTA Finishes Another Great Year! 2013 was another record setting year for IRTA and UC as both organizations surpassed their goals for the year. * UC trading set an all-time annual trading record of over 8.5 million for 2013 and set an all-time monthly record of 1.1 million in December of 2013. * IRTA and UC surpassed their cash revenue goals for 2013 by 9%. * Held an incredibly successful 34th Annual International Convention at the five-star Las Vegas Venetian Resort attended by 130 barter professionals representing 45 barter exchanges and complementary currency organizations from all over the globe. * Provided CTB training and certification to a record number 25 people at the IRTA Las Vegas Convention. * Issued a comprehensive Franchise and License Agreements Advisory Memo which provided the legal parameters of proper franchise and licensing for the industry. * Along with the U.N. and the STRO Foundation, IRTA provided critical support to a Kenyan based non-profit community currency group (Koru-Kenya, Bangla-Pesa’s) to help get criminal charges against the group dropped by the Kenyan government. The project is operational again with government support. * Attended and contributed to two European meetings in an effort to build IRTA’s international base and affiliations with other complementary currency systems. * Hosted a three day meeting in Washington D.C. with the International Islamic Trade Finance Corporation in an effort to develop a multi-layered barter system for 57 Islamic countries. * Engaged in discussions with Chinese representatives to establish a barter training protocol and barter system for China. * Launched a new website design for IRTA’s website in February 2013. * Elevated IRTA’s social media program and created IRTA YouTube and LinkedIn sites. * Significantly increased membership in both IRTA and UC. * Provided warnings to the industry regarding unscrupulous organizations that threaten the prestige and positive reputation of the barter industry. 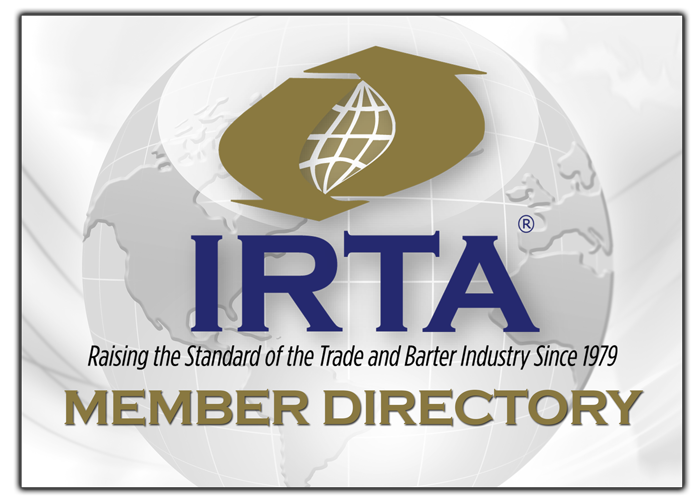 IRTA and UC will continue to pro-actively advocate for barter and complementary currency systems in 2014. We encourage you to get more involved in IRTA and UC in 2014 and welcome your participation. Thank you to all of the devoted volunteers that serve on important committees and to my fellow Global Board Members who generously commit their time and resources. We look forward to another great year in 2014 filled with creative new initiatives that will benefit your business and our industry in general.